Positional Color, Office of the Secretary of the Army. This flag features the basic insignia of the Army, the Coat of Arms of the U.S. in proper colors, as it's principal charge. The four stars in the corners are common to the flags of most Cabinet secretaries. This color is always displayed with cord and tassels of red and white. Positional Color, Under Secretary of the Army. This flag is similar to the Secretary's flag, but with colors reversed -- white field, red stars -- and a red fringe. It is displayed with cord and tassels of red and white. Positional Color, Offices of the Assistant Secretaries of the Army. Like the color for the Under Secretary, but the stars and fringe are "national flag" blue; cord and tassels are "national flag" blue and white. An image of an example of a 1940s-era Under Secretary of War is archived here. 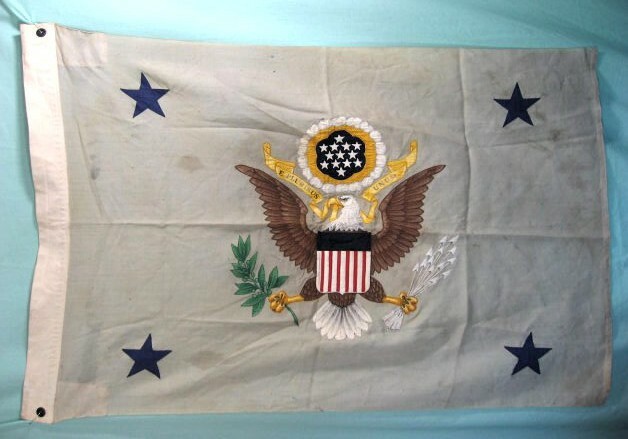 It was posted for sale on e-Bay with the comment: "This is an original Assistant Secretary of the Army original flag and not a more recent reproduction or replica. The size is approx. 44 x 51.25 inches and the condition is good with some neat embroidery and sewn on stars. It has some soiling and staining all over and numerous small holes as shown in the photos. It is a doubled sided flag with an emblem sewn on both sides." I believe that the flag with the blue stars was introduced circa 1940 when the post of Under Secretary of War was created. The Under Secretary became the new number-two in the Department of War and took over the flag with white field and red stars formerly used by assistant secretaries (by then there were more than one). Assistant secretaries were then given the same flag with white field and blue stars. As the same design is used today for assistant secretaries of the Army--the change from Department of War to Department of the Army dating to 1947--it would be only by examining the actual object that one could determine whether it was made in 1947 or 2007. Positional Color, Offices of the Principal Staff Assistants to the Secretary of the Army. This attractive color is authorized for the Secretary's chief bureaucratic assistants, e.g. the Chief of Public Affairs and the Auditor General.